At Harvest, we know that our responsibility goes beyond just being commercially successful. We believe in the importance of family and community. This year we have chosen two excellent charities to support, both of which reflect our core values, putting the family at the heart of the community. 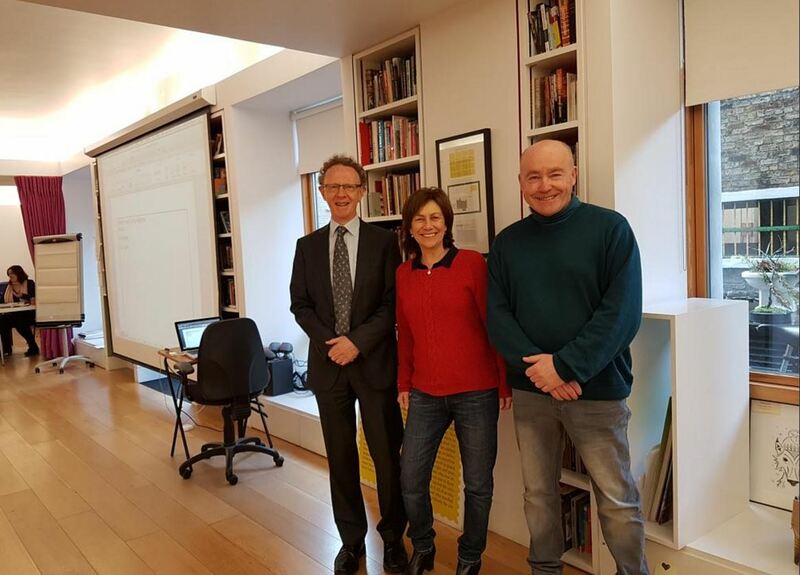 Fighting Words is a charity founded by Roddy Doyle which encourages writing skills among schoolchildren, particularly focusing on kids from more deprived backgrounds. The charity has enjoyed impressive expansion in recent years and will soon have ten centres operating in Ireland. On top of that, they have enquiries for assistance and guidance from around Europe and even from as far afield as Lagos in Nigeria. 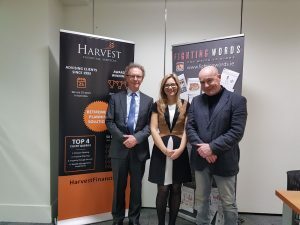 Harvest selected Fighting Words as one of its chosen charities to support in 2017 and has decided to continue its support for 2018. Pictured above are Terry Devitt and Aoife Lovett of Harvest and Sean Love of Fighting Words. Pictured above are Terry Devitt and Aoife Lovett of Harvest and Sean Love of Fighting Words. 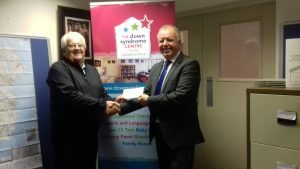 The Down Syndrome Centre was founded by Peter Gaw and his wife, Mary as a result of their frustration at not being able to access relevant services for their two youngest children, both of whom have Down syndrome. 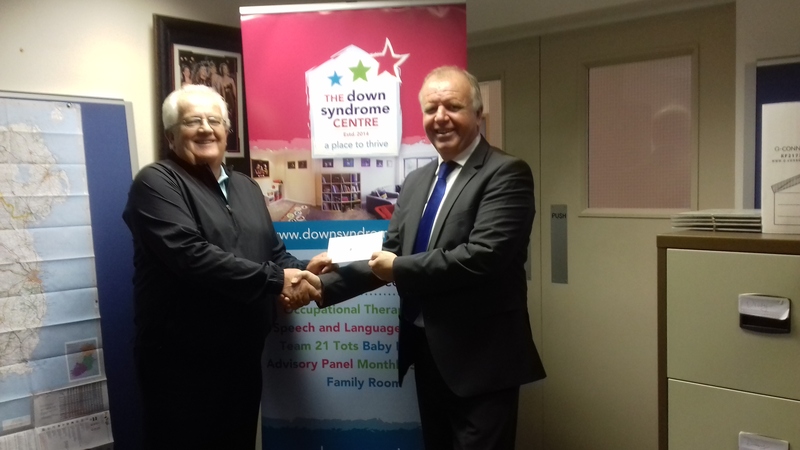 The charity had been around for a few years and, in October 2014, were finally able to open the doors to Ireland’s first (and only) services-led centre for children with Down syndrome and their families. Fighting Words provides free tutoring and mentoring in creative writing and related arts to as many children, young adults and adults with special needs as we can reach. Fighting Words programmes and workshops are delivered mainly by volunteer writing tutors. Fighting Words workshops are created and run by volunteers, including professional writers – novelists, screen-writers, journalists, poets – aspiring writers and students. Fighting Words helps students of all ages to develop their writing skills and to explore their love of writing. 94% of Fighting Words funding comes from private individuals and institutions and was was established by Roddy Doyle and Sean Love. Inspired by 826 National in the United States, Fighting Words is located on Behan Square, Russell Street, Dublin 1. Our Sports and Social Club will be organising a number of events during the year to support the charities and raise awareness with our colleagues and clients. The first being a 10K road race on 9th April. We wish all our colleagues, especially Terry Devitt on his maiden 10k race, the best of luck.